Finial adapter for 1 13/16" pole. Black gold rust iron collection by Gifer. Black gold rust iron collection by Gifer. Three lengths available in three colors, black, black gold, black rust.Sizes over 100" will have to ship by truck. Over size and truck charges will be added. Call for freight quote. 6115-025: Adjustable Kirsch standard curtain rod 48" to 86"
Tassel fringe , cut yardage price, available in 13.5 yard put up. Use on curtains, draperies, pillows, upholstery and many other remodel projects. Set. Includes rod, brackets and baton. White finish. Base price is for first 3 feet. Uses 94008 track, pinch pleat cubicle ripplefold. 16' maximum one way, 32' maximum two way. 32 and 64 pound limitations respectively. Sizes over 94 inches will have an oversize freight charge manually added. Notification of amount will be emailed for approval before shipping.First 3 feet included in base price. Plus truck freight over 104". Vintage holdback for draperies. 3 inches by 4 inch projection. Made of cast iron. Some colors are more than base price. White finish. Bulk Pack, rod only Bulk pack 10 each. Bulk pack for large users. See below for smaller packs. Superfine traverse rods. Rod only. Two way draw. Kirsch drapery rods, Superfine Traverse Rods Bulk Pack includes rod only.Brackets, supports and cord pulley must be ordered separately. Made from heavy guage steel with a baked enamel finish. Exclusive Kirlon on all sliding surfaces. Push in brackets and extension plates are available as an option. Only the finest pulley sets are used. Strong and durable with a slide gate for easy removal of extra slides. Long wearing, stretch resistant polyester cord and continuous lacing for use at either end or to convert to a one way draw. Two way draw, extends from 86 to 150 inches. Cafe curtain rods 1/2" x 78 3/4"
Black gold rust collection by Gifer. This set include 78 3/4" cafe curtain rod, 3 brackets and 2 finials. Available in three colors, black, black gold, black rust. Matching rings available, sku 2.A112, see link below. Use Kirsch architrac series 9600 for pinch pleats and cubicle drapery applications. Super heavy duty. White finish. Projection, 2 3/4 to 4 1/4 inches. Clearance 2 to 3 1/2 inches. A commitment to quality. Graber super heavy duty features include a universal front loading end bracket, metal adjustable and reversible master carriers ball bearing end pulleys, a spring loaded side gate for adding or removing slides, molded, canted slides, can be converted to one way draw, scored center support base for easy mounting on narrow casings, universal cam lock stirrup, braided polyester cord, and angled tip on overlap arm. Madrid French door sheer curtain panels in choice of 2 solid color fabrics. Pattern Madrid. Madrid sheer curtains are designed to use with standard curtain rods. Pocket size is 1 1/2". Sold as a single panel. The 59" panel will cover about 20" of window width when pleated onto a curtain rod. Pocket at top and bottom. Care Instructions: Machine wash using cold water. Low heat setting on dryer should be used. White finish sash curtain rods. Flat curtain rods for French doors. Two sash rods per pack one for over the glass, one for under the glass to hold curtain to door when opening and closing. Fluted decorative curtain rods ring slides 100"-180"
Brass finish curtain rods. Decorative Curtain Rods by Kirsch. Sizes over 94 inches will have an oversize charge. 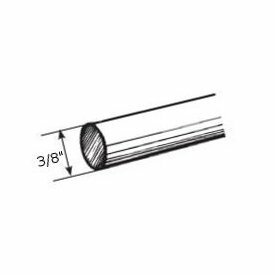 HD27114D: Fluted decorative traverse rods ring slides 38"-66"
Use with the Graber wide face Dalphine 2 1/2" curtain rods. Corner drapery rods by Graber. White finish. Bay window drapery rods. by Graber. 2 hinges and 2 center supports per envelope. Order in 12 foot increments. Cord draw, ceiling or wall mount. For pinch pleat or Ripplefold systems (sometimes called coil drapery).